The impressive cold has had me watching the ice on the bay. It’s been many years since I have seen it appear white all the way to Northport. 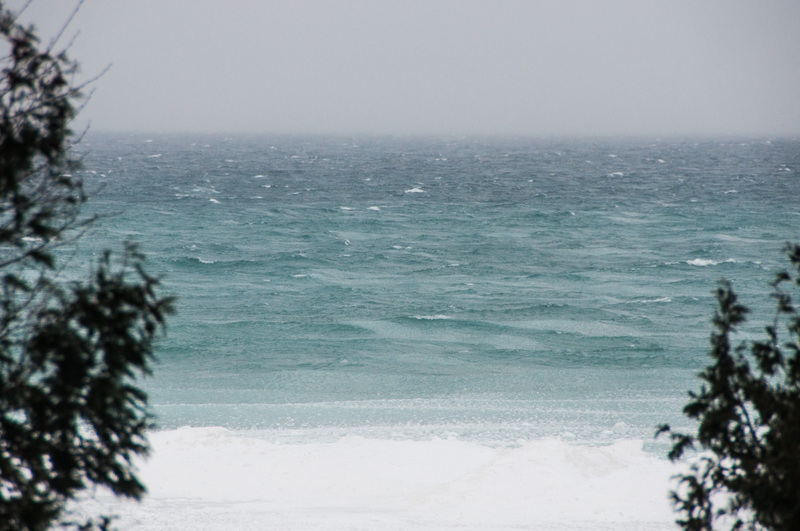 On Thursday, I could only see a few strips of open water between here and Northport. Could this be another year with a frozen over bay? Then came today’s blizzard. Where did all the ice go? My roof top weather monitor has been recording 30 mile per hour gusts. That plus heavy snow might have persuaded me to stay inside. 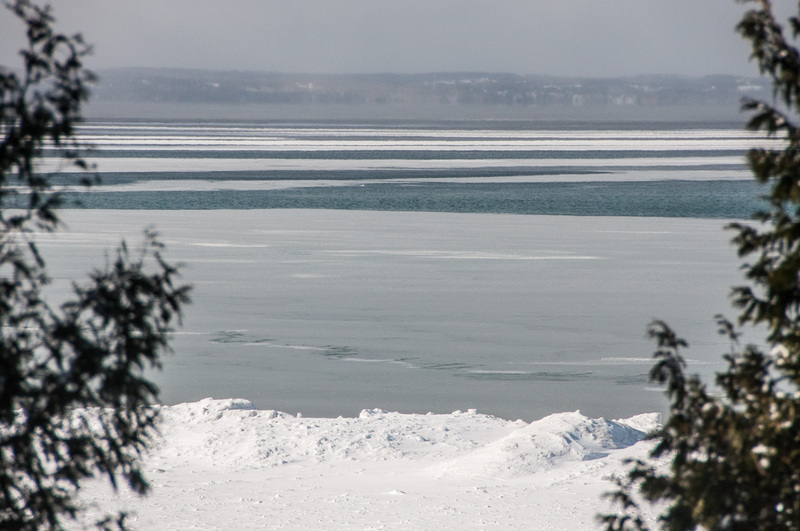 But I decided I wanted to see if Torch Lake had frozen over. Unfortunately, there was no way to know because there was a complete whiteout at the Eastport boat launch area. That whiteout also prevented me from seeing that I was driving over a snow drift. And then the trusty four wheel drive Ford settled on top of the drift. All four wheels spun helplessly. Fortunately, I had a shovel in the car. Wait, wait! We finally get to the payoff and there is no amusing photo! Ah well. You will have to use your imagination. I am busy eating Andi’s cookies. We must keep up our strength in order to sweep the steps for the third time in 12 hours. Miss Sadie has decided that she wants to go outside after all. When I left northern Door County it felt like I’d released myself from a bear trap. Of course, many people will drop their jaw at that statement. Cold isolation is no friend of mine and I don’t think it’s meant to be friends with anyone- they just don’t know it. Cookies are friends and friends bringing cookies are friends. I really am ready to leave all this winter to those who can better endure or enjoy it. In the meantime: Cookie up! I find that a little cookie makes all the difference – particularly a little cookie baked with care by Andi. I hear you Gerry, since as lifetime Alden resident, now year-round, I find those questions about “how it is all winter” very challenging. You can say cold or grey, but your video shows exactly how short of the truth that falls. I also know that our weather is “better” than yours because you are on the big lake. But it does make me realize what the pioneer days might have been like for those sturdy enough to endure. A short while ago I shoveled the path from my door to my car and felt a bit wimpy for going back to the expensively heated house. It’s been awhile since we had a winter like this one. We’ve had some that were really very pretty. I remember blue skies, sparkly snow, clear roads . . . Ah well. Mama Nature will have her little moods. I am sorry I didn’t take a photo of the car pitifully caught on the snow drift. Ah, but you brought cookies and that makes all the difference. You are not the only person who has been perched on a snowpile. Louan found herself beached on that little triangular bit at 8th Street and Munson Avenue in TC. She was rescued by a burly team of high school athletes who picked up her little car and set it down on the street. It is good to have neighborly athletes. I was just explaining to someone ‘down here’ about life ‘up there’ and how you never drive anywhere without a blanket, extra hats, mittens, a shovel, maybe water and food. They raised their eyebrows in question. This year even ‘down here’ my advice would be the same. Never leave home without a shovel at the very least. And cookies. Actually, that video is a salutary reminder of The Reality of Winter. I think it’s the wind that does it. Perhaps my most unusual winter memory is of the blizzard that came with such strong winds two sides of my grandparents’ house were covered with snow to the roof. Unfortunately, those were the sides of the house that had doors. Fortunately, there was nothing but bare grass on the other side. My dad climbed out a window with the snow shovel, went around and went to work. I hope we gave him cookies when he was done, too. Stay warm and happy, all of you! It’s important to have an exit on the side away from the prevailing winds. Then it’s important to make sure it doesn’t get frozen shut. Sigh. I think I’ll go have another cookie. That Andi – she’s a peach, she is. We too are have an unseasonably evil winter. More snow than in the previous four years combined ! And the cold — oh the cold has been snotty awful. I think your gonna need more cookies to get through February. The Township hall–which has emergency generators–opens a warming center if the power goes down Around Here in winter. Maybe I should make some cookies to bring with me . . . It is almost impossible to overestimate the importance of cookies in a winter survival plan. Especially homemade cookies. That sounds like a pretty awesome weatherman! I hope he got some excellent treats too for his valiant efforts. I’m sure there were plenty of cookies left up at the Weather Station on the Bay. Andi is very, very good at baking. Bruce and Andi are good at sharing their excellent treats, too, which is why they are svelte and energetic as they ski through the woods on the nicely groomed trails, while I am here at the Writing Studio and Bait Shop wiping telltale crumbs off my keyboard.. The only way to be when it’s snowing and blowing a hoolie is with the blowing snow outside and you inside with cookies. This is what you call your Universal Truth. It’s supposed to get down to a low 8 F/-13 C here tonight. I live at the same latitude as Casablanca, Morocco, BTW (although we have a lot more latitude than they do). I wish Canada would keep it’s cotton-picking polar vortices to itself. Do you carry a sack of non-clumping kitty litter in your trunk? Supposed to be the best thing ever for when your car is stuck on ice. I read that wrong and thought, “a cat stuck on ice??? ?” It’s a picture. I used to carry a pail of sand in my trunk, but I think I used it all up. Hmmm. Ooop, make that “Its” cotton picking polar vortices. Shame on me. Kitty litter was one of the things I used to free the car when I ran into a big snow drift on my own driveway today. A shovel and a snowblower were also needed for the rescue. Twice blessed, eh? Ah well. I seem to recall posting the story of the time I got stuck in my own garage. That was definitely a low point. DAWG it’s cold out there. For the first time in my experience SMU (southern Michigan universities) closed earlier this week not because of snow, but because it was just too cold to go to class. Darn it, I had already scheduled Tuesday as an online class day. When I lived in the UP I walked ot work. I noticed right away that fashion was not a deciding factor in what people wore. Survival was. It was an AHA moment…and sticks with me today. You have completely distracted me with putting thoughts of COOKIES into my head! Thanks a lot, Gerry (she commented ironically). I’m happy that you were looking over toward NORTHPORT recently, as I often look east from our harbor and think of YOU! All these FULL CAPS? I am excited beyond measure to have gotten out of the house and to my bookstore today, after many housebound days. Lakes freezing over? Wouldn’t it be amazing if they didn’t?